Puppies should be vaccinated at 8, 12 and 16 weeks of age. Kittens should also be vaccinated at 8, 12 and 16 weeks of age. The next FVRCP for cats and DHPP for dogs is then done 1 year later and then every 3 years. This is one of the most crucial vaccines that your dog will need to get. This vaccine should be given 1 year after the initial vaccinations and done every 3 years following. With rattlesnakes in the area, this is an important vaccine to get. Many people don't think it is necessary, but if your dog is bitten, the vaccine could save it's life. This is a very important vaccination to give to your cat, especially if it is an outdoor cat. These vaccinations should be administered 1 year after the initial vaccinations and every year following. 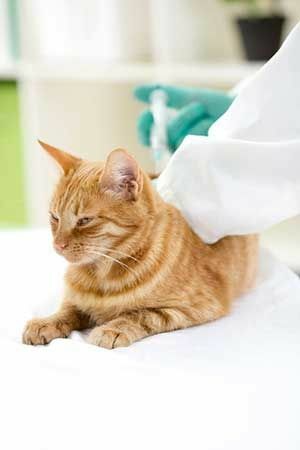 Spread by the saliva or discharge from the nose and eyes in infected cats, it can also survive in its environment. Like feline calicivirus, it is a type of ‘cat flu’ as its symptoms include fever, sneezing, conjunctivitis and discharge from the eyes. Once a cat has had feline herpes it is infected for life and may suffer recurrent flare-ups that are treated with antibiotics and eye drops. This disease is thought to require very close contact of infected cats to be spread, such as milk from mother to kitten or bite wounds. Much more common in city areas, and among un-neutered and stray cats. Multi-cat households also present a higher risk. The symptoms include poor body condition and coat, anorexia, diarrhea and jaundice. The virus attacks the bone marrow which results in leukemia and sometimes lymphoma.